Disclaimer: this review was originally written by the team at ADAPT Network, who have kindly allowed us to republish this on Painless Movement. ADAPT Network is a website that writes great articles about fun and exciting ways to keep active including outdoor and adventure sports. They also took the time to use and review the Varidesk Soho (Laptop 30), and we wanted to share their thoughts with you. “Sitting is the new smoking!” – as so many people are claiming. Affecting the couch-bound, desk-jockey, TV-watching, modern generations, hours and hours of sitting is slowly killing us. It is true that more and more people are living sedentary lifestyles and more people need more activity and exercise in their day to day lives. Ok, this may sound a little dramatic and in fact, for more active people out there this is not the case at all. We still think though, no matter your level of daily activity, you should consider taking a look at the standing desk movement for improvements in posture, productivity, and overall well-being. Small changes, such as standing for just a few extra hours per day can really make huge long-term changes and benefit your overall health and well-being greatly. Here we look at a review of the Varidesk Soho, otherwise known as the Varidesk Laptop 30, a product that can help you make one of these small changes. The Laptop 30 is small and compact and perfect for laptop users who want to create their own standing workstation. The Laptop 30 sits in the class of standing desks known as desk converters, or desk risers. 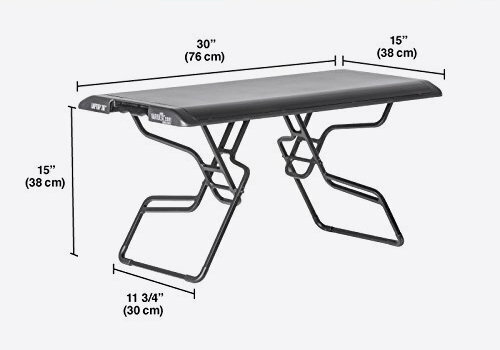 As opposed to full height adjustable desks that replace your current desk, a converter sits on top of any surface to transform it into a sit-to-stand workstation. Varidesk, a company from Texas, has developed a number of ergonomic office products that allow people to switch between sitting and standing while at work. They have many different solutions for this new phenomenon, and the cheapest and most compact of these is the Laptop 30. The is far cheaper than a traditional desk converter, although still more expensive than other similar products on the market. The team at ADAPT Network used this product for a few weeks and describe how it is quite clear to see that the design and the build quality of this product make it a great product and really good value for money. The most important thing to note is the size and weight of the product. If you are looking for a truly compact and transportable standing desk, then the Laptop 30 is really a great choice. It is also easy to fold into its flat state and keep it stashed away when not in use. It has a little of extra weight from the spring lifting mechanism, but you’ll find that this is a real life-saver over time. This spring mechanism means that you don’t have to exert much force at all to raise the desk and whatever you put on it into higher positions. Rather than other similar products, which require you to manually change the height and also hold the weight of your laptop too, the Laptop 30 can bear this weight and makes lifting the unit a breeze. The Laptop 30 has a total of 10 locking height positions, the highest one being 15”. This adjustable range makes it pretty versatile for many users, although probably not ideal for taller people. Lastly, despite its compact and small nature, the Laptop 30 has a surprisingly large desktop surface area. 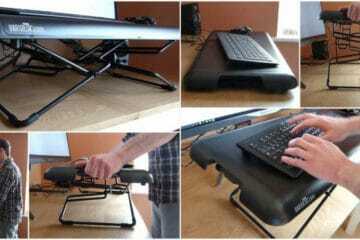 There is plenty of room to sit a laptop, or otherwise, you can easily use it to place your keyboard and mouse. If you have a desktop computer, then you can still benefit from a product like the Laptop 30 as you can use it as an adjustable keyboard and mouse tray. Also, despite the compact size of the product, the Laptop 30 can hold up to 15 lbs on its surface. This is plenty of weight an more than enough for even larger gaming laptops. Ben from ADAPT Network used the Laptop 30 with his desktop computer as a keyboard and mouse tray, and also with his laptop, to give the product a thorough test. The product has plenty of room to maneuver thanks to the decent desktop surface area. It is also small and versatile so it will fit on top of most desks, and can easily be stored when not in use. ADAPT Network also says, that while there are cheaper products on the market, it would be hard to find one of this quality and design and that the extra money is worth it. One thing to consider is what you place on the surface. The textured surface is fantastic for most items that have rubber feet (such as most laptops, keyboards etc.) but can be a little slippery for other items. For example, a cup of coffee or a glass of water on the Laptop 30 is quite likely to slide off and this is obviously not ideal with computers in the mix. The last piece of advice from ADAPT Network is to take a look at other products such as a balance board in order to really get active at the office. A balance board will enhance your standing desk experience even further, and it can be quite fun too! 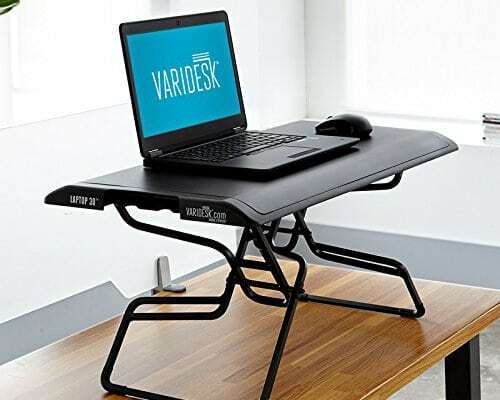 As a standing desk solution for laptop users, the Varidesk Laptop 30 is a great product. We like the fact that it could also be used as a keyboard and mouse tray for those people that already have adjustable monitors or those who are using desktops as well as laptops. It is well-built, well-designed, stable and versatile. It has a few small issues such as a slippery surface and the fact that there are cheaper alternatives available, but we don’t think this should deter you from considering this product.